Ron Kidd started curling at the age of 13, with one of his school teachers, on Natural ice in Lumsden and that started a lifelong involvement in the sport. He recalls curling in the annual Spring Bonspiel in March one year. They had an early spring thaw that year and had to curl during the night. That spiel was so memorable that Ron even remembers that they won a silver cream and sugar tray set, which he still has! Quite liking the sport, Ron became more involved over the years and curled in numerous bonspiels in Saskatoon, Moose Jaw, Yorkton and Regina plus all of the local bonspiels in the Lumsden area. He also curled in men’s and mixed playdowns over the years as well as senior playdowns. In 1968 he curled in the Southern Men’s playdowns and in 1995 curled in the Southern Senior playdowns. One of Ron’s curling career highlights was winning the Provincial Lions Curling Championship in 1983. When Ron’s daughter started curling in High School, he became a Level 1 Coach and coached her High School Team from 1987 to 1990. He became interested in the officiating side of the game after attending the National Juniors in 1990 and the World Juniors in 1991 while cheering on his daughter Darlene, who was curling with Atina Ford. His first assignment as a curling official was in 1992 at a Provincial Junior Boy’s Championship in Moosomin, with legendary curling official, the late Arleen Day as his mentor. After that he was hooked and has officiated at multiple events since. He has officiated at all events from Under 18 to Masters. He has officiated at 6 National Juniors, Briers and Scotties events in Regina and at the World Women’s in Moose Jaw and Swift Current. In addition to officiating for the Saskatchewan Curling Association (SCA), Ron served as an SCA District Coordinator for Region 6 for eight years. However, his involvement with the Lumsden Curling Club, might be where he has made his most significant contribution to the sport. He has served on the executive for at least 30 years. He has organized leagues and prepared draws for bonspiels. He started an afternoon senior’s league and has organized that league for 20 years. He also manages the Lumsden Curling Club bingo fundraiser to help the club survive. We are told that he checks the facility daily, winter and summer. 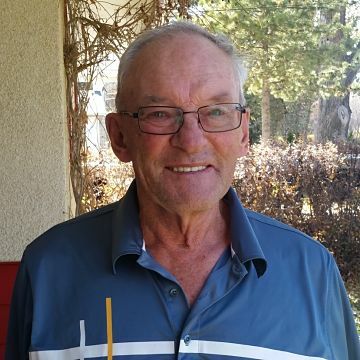 In his nomination submission, Darrell Brandt from the Lumsden Curling Club said “Ron worked endlessly during the good years and the lean years for the Curling Club. He is the single biggest reason the club is still active and thriving.” In 2007 Ron’s dedication to the club and sport was recognized by granting Ron a Life Membership in the Lumsden Curling Club. Welcome Ron, into the Legends of Curling Honour Roll in the Builder and Officials Category. Congratulations!